Since 1961, Donaldson Docks has been building the strongest, most reliable, and easily customizable docks in the Midwest. See for yourself why customers have been exceptionally satisfied with Donaldson Docks for over 55 years! If you’re looking for a versatile, affordable and “cool to the touch” dock, you’ve come to the right place. Since 1961, Donaldson Docks has been building the most reliable and easily customizable docks in the Midwest. 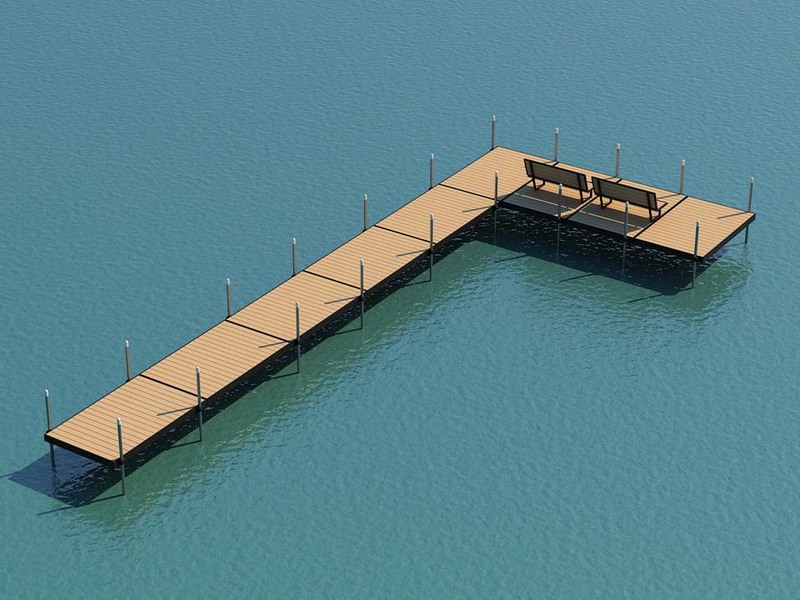 We take pride in building the strongest, most durable docks around. While other docks can be badly damaged by high winds and waves caused by summer storms, ours can withstand the harshest of elements and still look great. Due to our unique design and the quality of our materials, Donaldson Docks are ready for anything Mother Nature has in store. Our docks are beautiful, with a natural look that is sure to impress. They’re also light, sturdy and require minimal assembly. Initial installation is even included within the Iowa Great Lakes area. To make things even better, we have a 5-year warranty so you don’t have to worry about your dock, and can instead spend your time enjoying the beauty of the lake with your friends and family. 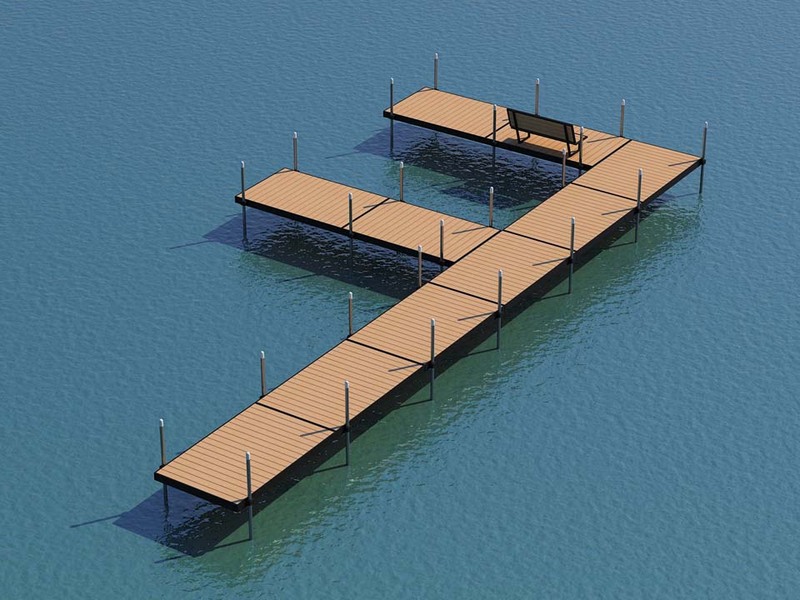 Our Docks Are Engineered to Withstand the Worst of Summer Thunderstorms. At Donaldson Docks, our goal is to make sure that the possibilities are endless when it comes to the layout of your dock. We want you to make your dock your own, and to be able to customize it in the way that works best for you and your family. Any configuration is conceivable since our docks are custom fabricated to order! Standard dock sections are 4-foot-wide by 8-foot-long. Here are just a few of the many options you have available when choosing a custom built Donaldson Dock. (Hover over each box to see the descriptions). Our docks are exceedingly durable and lightweight. In fact, our docks have withstood severe thunderstorms when all other docks were damaged beyond repair. We have superior user-friendly hardware that makes our docks easy to install and easy to remove. (Initial installation is included in the Iowa Great Lakes region). Walk barefooted on a Donaldson Dock even on the hottest of Midwest summer days. Our powder coat dock finish gives an appealing natural look and never has to be painted! 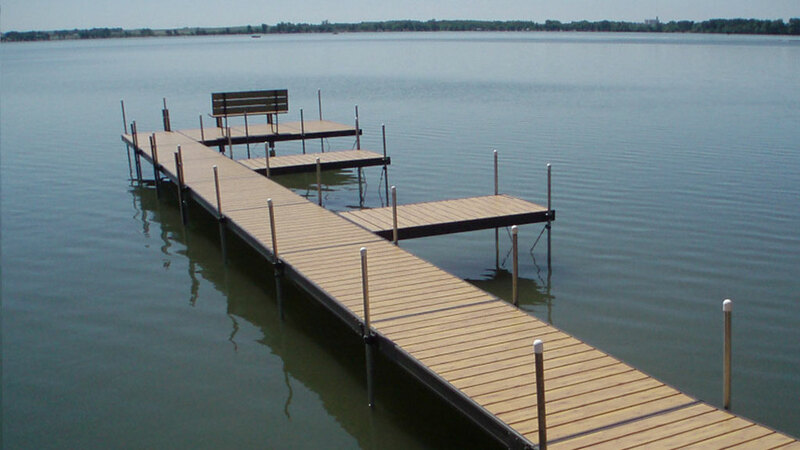 What makes our docks so durable and versatile is that they are constructed using lightweight, aluminum platforms supported with steel poles. With uniquely designed brackets, strong hardware and cross bracing, we guarantee that your dock will endure for many summers to come, no matter what Mother Nature has in mind. 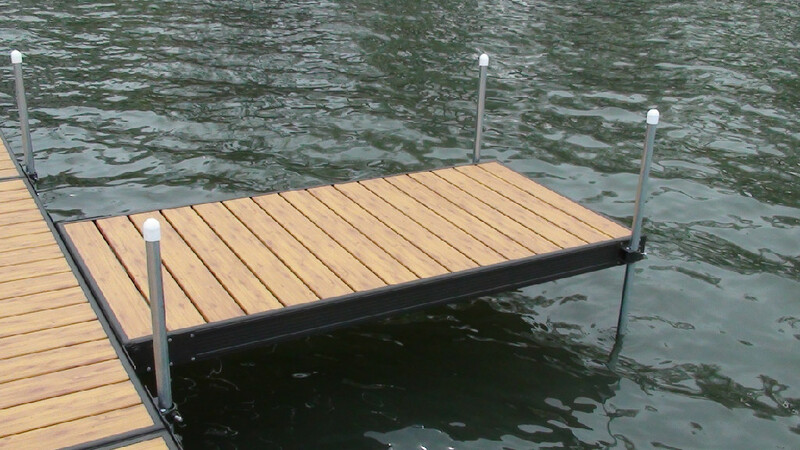 Our docks also have aluminum platforms and benches that are powder coated to simulate a natural wood grained dock. Powder coating is much thicker than paint, and is applied using a magnetic charge that bonds the coating to the aluminum to ensure everlasting strength and beauty. Whether you’re considering a small section dock for your residential property or a large custom dock with multiple boat slips for commercial use, the four-foot-wide by eight-foot-long dock sections can be configured into many different layouts to suit any need. 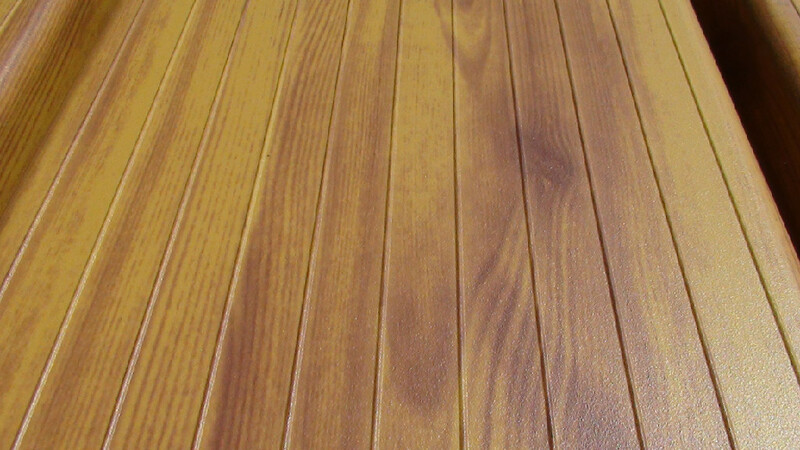 We also have used, reconditioned Redwood and Cedar Docks for purchase. You’ll be impressed with how simple it is to get your new dock set up, as they are designed to be easily installed by the “Do It Yourself” kind of person. But if you need a hand, Donaldson Docks offers free initial installation in the Iowa Great Lakes Area. Removal and future installations can be arranged for a minimal fee. At Donaldson Docks, we hold the value of customer service in high regards. Each client is equally important as the next, and we take pride in tailoring to each customer’s particular needs by providing them with efficient and friendly service. Our goal is to accommodate to your specific requirements while maintaining extremely competitive prices and exceptional support. Donaldson Docks are also backed by a 5-year warranty against manufacture defects. We want to make sure that year-after-year you and your family can continue enjoying the beauty of the lakes on our “cool to the touch” docks, no matter how hot it is outside. 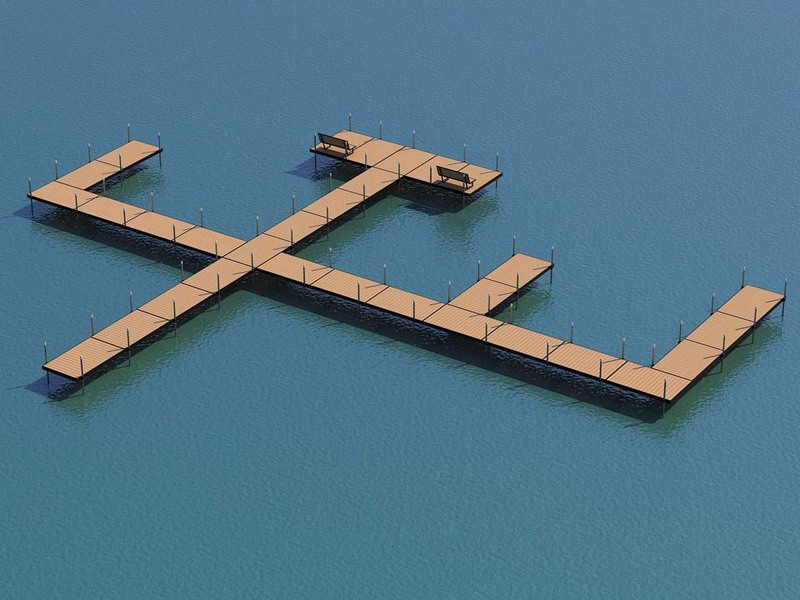 When boaters are cruising the lakes, whether in Okoboji or elsewhere, they’ll admire your remarkable Donaldson Dock. Donaldson Docks is the Midwest’s most dependable boat dock company. 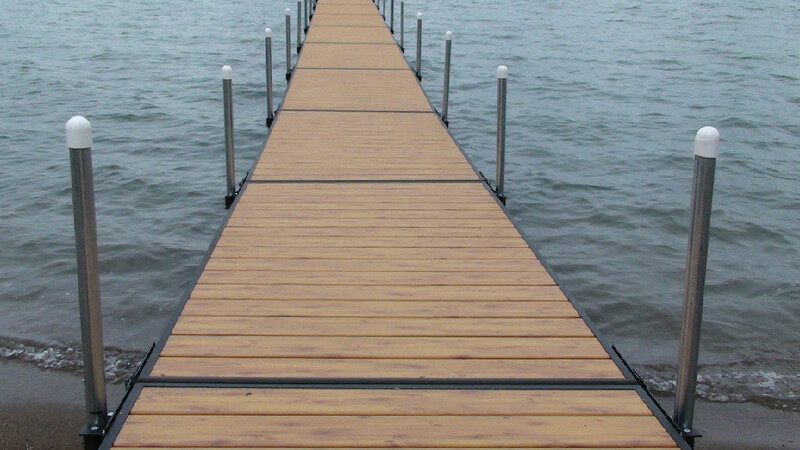 We build and sell the strongest, most durable boat docks for the great lakes region of Okoboji and Sprit Lake, Iowa -- and the lakes of Minnesota, Nebraska and South Dakota. COPYRIGHT @2018 Donaldson Docks | ALL RIGHTS RESERVED | Web Design and SEO provided by Michael Quinn Agency, LLC.